Composer, violinist and vocalist Caroline Shaw responds to Beethoven’s Piano Concerto No. 3 with Watermark. 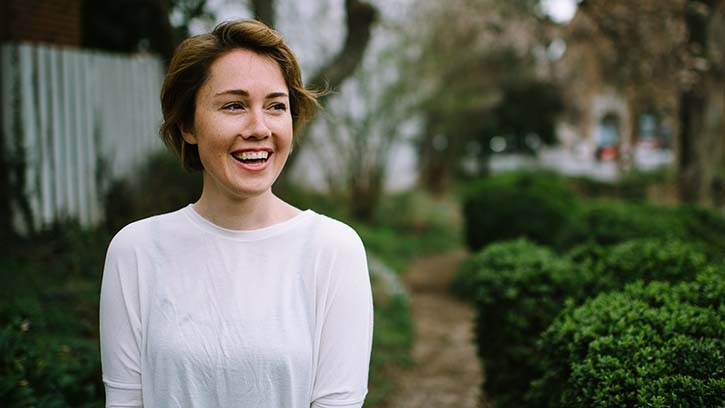 Caroline Shaw, whose new piano concerto receives its first performances with the Seattle Symphony on January 31–February 22, is a musician through and through. Still in her 30s, she has established herself as an instrumentalist and singer of professional caliber and as one of the most engaging composers working today. Refuting the romantic cliché of the tortured artist, she also is an exceptionally pleasant person. This last observation is based on very slight acquaintance — just a pair of phone conversations and a brief in-person encounter — but it is made confidently, so readily do Shaw’s thoughtfulness, generosity, gentle humor and lack of pretension reveal themselves. Thoughtfulness and lack of pretension are also salient qualities of her compositions, along with a wonderful aural imagination and manifest joy in making music. Shaw’s achievements in any of the three spheres of musical activity to which she has applied herself are enough to constitute a successful career. An accomplished violinist, she has performed with ensembles devoted to both new and old music and has played the solo part of her own violin concerto with several major orchestras. She also is active as a singer with the brilliantly innovative vocal ensemble Roomful of Teeth. You can hear them on the Seattle Symphony’s live recording of Berio’s Sinfonia, released on Seattle Symphony Media last summer. While remaining busy as a performer, Shaw has emerged as an especially skilled and inventive composer, a status confirmed when her Partita for 8 Voices received the 2013 Pulitzer Prize. At age 30, she was the youngest musician ever to have received that prestigious award. Though well-schooled — she wrote her prize-winning Partita while studying for a PhD in composition at Princeton — Shaw is far from academic in her approach to music. She tends to describe her works not in terms of compositional techniques but as colors and flavors. Her violin concerto, for example, is “citrus, chocolate, blue.” Her compositional idiom is eclectic in the best sense, and she says that she writes for performers who share her love of music, not to satisfy scholastic norms. It testifies to Shaw’s disinterest in musical boundaries that she is composing a song cycle for Renée Fleming — the stellar soprano has already performed part of that work — and has collaborated on recordings with several pop artists, most notably rapper Kanye West. To hear what post-modern choral music meets hip-hop sounds like, listen to the Shaw/West version of Say You Will. The broad range of Shaw’s compositional palette allows her to write for orchestra, string quartet and other traditional ensembles and use electronic sound processing with evident ease. Partita employs an array of unusual vocal sounds, yet Shaw has written music for a children’s story, including a tune so simple and catchy that the audience can pick it up and sing it during the performance. And while most of her music is precisely notated, Shaw is comfortable with improvisation as a musical option. Indeed, the solo part of her violin concerto remains unwritten; Shaw plays it extemporaneously in each performance. A particularly fascinating aspect of Shaw’s work is its engagement with music of the past. Older music and its composers are her “teachers,” Shaw says, and a number of her compositions refract the forms and sound of older music through a post-modern lens: Baroque dance forms in Partita, Classical-period string quartet writing in her quartet Entr’acte, Renaissance vocal polyphony in her arrangement of Kanye West’s Coldest Winter. Her new piano concerto, jointly commissioned by Seattle Symphony and the Saint Paul Chamber Orchestra, is a “response” to Beethoven’s Piano Concerto No. 3. When I reached her by phone in November, Shaw was just completing the piece and anticipating the premiere with pianist Jonathan Biss and the Seattle Symphony. The most obvious way in which she deliberately used Beethoven’s Third as a template is in retaining the classic concerto form of three movements in a fast-slow-fast design. Intrigued, I told her that I looked forward to hearing what the new concerto sounded like. “So do I,” she laughed. Witness the world premiere of Caroline Shaw’s new piano concerto, Watermark, on the same program as the piece it’s responding to, Beethoven’s Piano Concerto No. 3, on January 31 and February 1 and 2!